This week I discovered that I really could open a candle shop to rival Yankee, Ikea or Prices. I guess this would be ok if I was an avid candle burner, but my husband really doesn't like the flickering light they give out. So whilst I would love to sit by candle light on an evening, I usually manage about 30 mins before I'm asked if we can put the light on so I simply don't bother any more. This means that my pre-husband candle stash is still sitting around unburnt and unloved. Total 69 candles - not including the ones I have on the mantle piece 'cos they look nice! Yes that is a lot of candles for a household which doesn't use them! But, they are really heavy so don't really want to post them, I guess eBay is out of the question then. I suppose a charity shop would accept the new ones but what to do with the used ones? There is still plenty of life in them and it seems such a shame to throw them in the bin. I don't use the candles so making new ones out of the old ones seems pointless, I don't skateboard or know anyone else who does so don't think skateboard wax block is an option. These are the only solutions I seem to be able to find online, have you any ideas? All ideas gratefully received, or if you want them - I'm in Basingstoke - drop me a note and happy for them to go to a good home. Unfortunately this probably means that the used ones will migrate from a cupboard and draw to a box in the garage - doesn't seem right... I will come back to you in a couple of weeks to report back that these have been ejected from the house one way or another. I love this, it actually made me chuckle. At the moment I think my equivalent is cardboard boxes, I thought we'd dealt with them all after the move, but I just keep finding them. 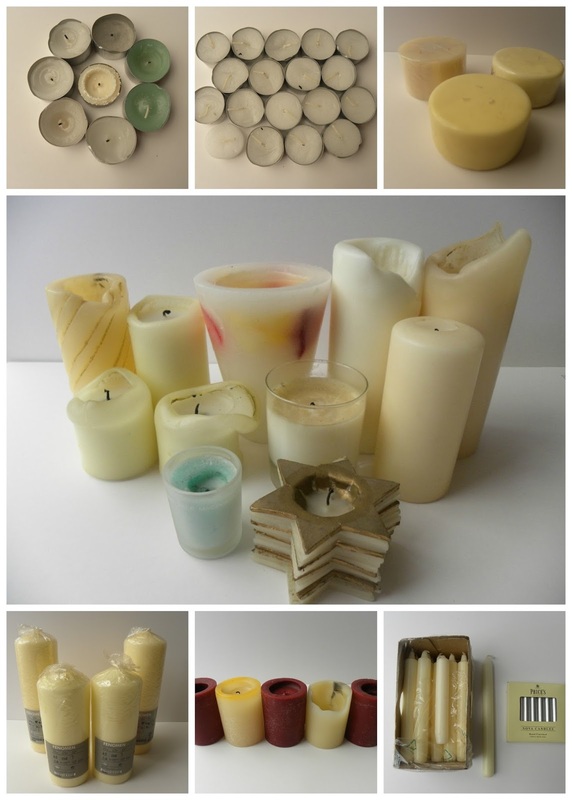 Could you use candles as outside decoration? I've seen people put tea lights into 'baubles' and hang them from trees (I admit I've seen pictures on Pinterest, not in real life). Otherwise do you have a Freecycle / Freegle list you can offer them on? So pleased it isn't just me. I had a laugh when I got them all out. Shocking. There are some lovely Pinterest ideas, not sure how practical or actually whether I'd be bothered. I should share that I didn't include citronella candles on the post, oh yes I have those too! Yes, or make them into new candles to sell on Christmas craft stall, candle tea cups? Or could you melt down, add lots of wicks to make a giant candle for outdoors, if you added some citronella it's not really a candle more of a 'bug-be-gone' device! Thanks, I think admitting my problem on the blog has been good therapy for me! Wax in cups is a good idea, though trawled the charity shops a while ago for cups and saucers to put sweets in for a friend's birthday and failed miserably so not sure if will be possible.